Situated in the overgrown meadow of an opening to the woods, Glitter and Whiskey Events and Makeup by Alli Kirk brought a fairytale vision to life in this styled shoot captured by Awake Photography through the use of romantic jewel tones, luxe decor and earthy natural elements. The team created floral arrangements to mimic the mood with ample greenery, wildflowers and blooms in shades of merlot and fuchsia. A bold paper suite from Paper Tie Affair introduced the thematic feel of the shoot with bright berry and black watercolored backgrounds. Suitable for a setting in the woods, Red Sage Catering whipped up plates of enticing farm-to-table bites incorporating fresh fruits, vegetables and herbs. Of course, we have to mention the bride’s glamorous and modern gown from Unbridaled – a strapless, cutout gown in the most stunning shade of taupe. 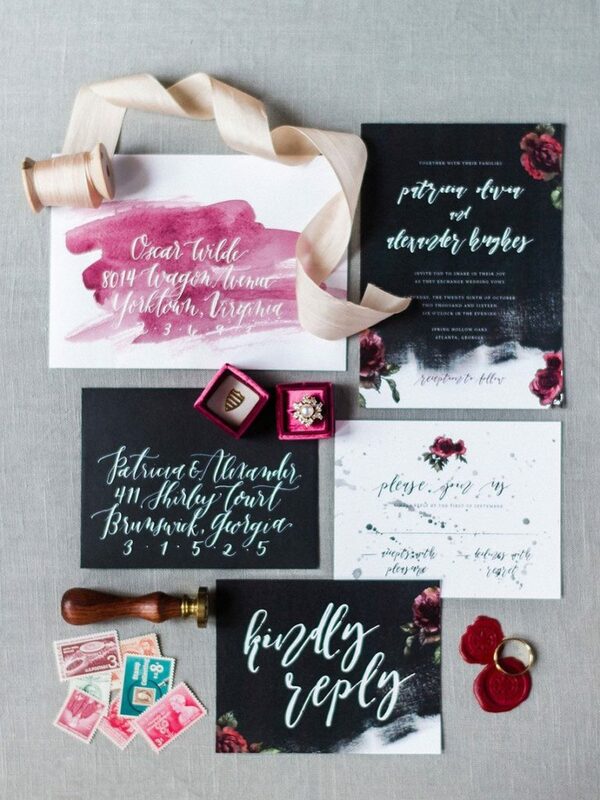 Incorporating elements of drama and sweet romance, we’re loving every detail of this shoot! Cheers!